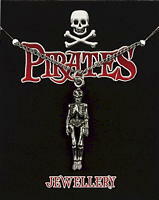 A pirate is someone who travels by ship or boat and commits robbery at sea or a coastal area. Thousands of pirates were active between 1650-1720, a time known as the "Golden Age" of piracy. Pirates were also known as corsairs or buccaneers. Corsairs were pirates who mainly operated in the Mediterranean Sea and buccaneers were pirates who operated in the Caribbean. This skeleton is made from lead-free pewter and is supplied on a silver chain. The information card is full colour on the front and has historical information on the reverse.